On Tuesday 2 December I attended The Student Engagement Partnership (TSEP) Principles of Student Engagement conversation event held at the Institute for Education. The Student Engagement Partnership supports, develops and promotes student engagement activity in the higher education sector in England. 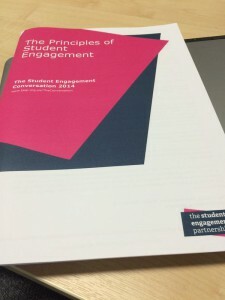 The-Principles-of-Student-Engagementhave been created through a review of literature on student engagement since 2010, including documented examples of current practice and with the guidance of the TSEP Steering Group. The conversation events have been held around England to consult on the principles. I was invited to be on the panel to represent the work we have been doing on student engagement at Jisc. I was delighted to be on the panel with Derfel Owen, Director of Academic Services at UCL, an inspiring advocate for student engagement through his work at the University of Exeter and at QAA. Derfel co-edited the ‘The Student Engagement Handbook: Practice in Higher Education’ with Liz Dunne. Sarah Mullins, a student representative at University Centre Doncaster and student reviewer for QAA was also on the panel. Sarah made a powerful plea to involve students in discussions and allow them to help shape the solutions. I spoke about the role technology plays in enabling and enhancing student engagement and empowering students who may not naturally get engaged in traditional engagement activities. The Summer of Student Innovation projects and the engagement of students in the Digital Student project in sharing their expectations and experiences of technology are examples of how we are engaging students in developing their digital environment. The Change Agents’ Network has an important role to play in promoting staff-student partnership working as a powerful approach to student engagement. We are looking forward to Ellie Russell’s CAN webinar on the Principles of Student Engagement which is taking place on Tuesday 27th January at 1:30. Ellie will be discussing the principles and also sharing feedback from the consultation events. Posted by Sarah Knight on December 3, 2014 in Uncategorized and tagged NUS, staff-student partnerships, Student Engagement, TSEP.